In year 3000 earth is ruled by a race of humanoid aliens called the Psychios. Most of the remaining humans on earth are slaves or have formed primitive tribes living in the outer badlands away from Psychio control. Deep in the Rocky mountains, Jonnie Goodboy Tyler (Barry Pepper) is a member of one of the tribes. Against the tribes wishes he sets out on a journey of exploration. He meets Carlo, a hunter, Both are captured by a Psycho raiding gang and are interred in a slave camp on the main base above the ruins of Denver Colorado. Earth’s security chief Ker (Forrest Whitaker) has been exiled to earth indefinitely. His deputy Teri (John Travolta) plans to use human slaves to mine gold in radio active areas and buy his way off of the planet earth. He selects Jonnie as the foreman of the project and educates him using a rapid learning machine. Jonnie is provided with slaves and a flying shuttle to go out and find gold. After learning everything he can about Psychios history and language, Jonnie plots an uprising against his oppressors. He manages to obtain some gold from Fort Knox and convinces Teri that this was gold his slaves had mined. The resistance find an abandoned US military base deep underground. They train themselves to use the aircraft and weapons that they have found. After strenuous training, the rebels launch an uprising using Harriar jets and nuclear weapons. Several of the fighters sacrifice themselves to destroy the hold that the Psychios have on earth. Ker sides with the humans when the battle comes to an end but Teri is imprisoned within a vault in Fort Knox. Although the humans prevail and gain control of earth again, the future is uncertain. 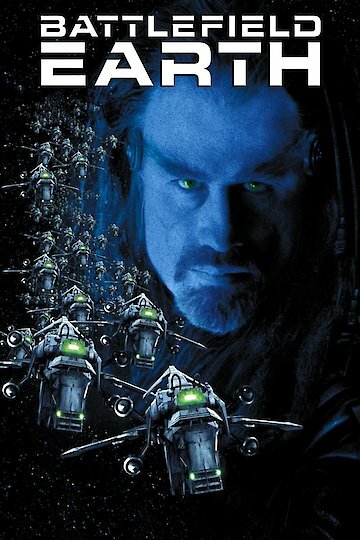 Battlefield Earth is currently available to watch and stream, download on demand at Netflix online.